In the last couple of years, GraphQL has taken on the scene in terms of frontend development due to the various advatanges it offers over REST. However, setting up your own GraphQL server is challenging, it&apos;s both error-prone and complicated. This has been made easier due to managed services such as Prisma which does the heavy lifting in your GraphQL server making it easier for you to instead focus on the development of you app. In this tutorial, we will be building a fully functional Recipe app using Prisma and React. To use Prisma locally, you need to have Docker installed on your machine. If you don&apos;t have Docker yet, you can download the Docker Community Edition here. Now that our prisma server is ready, we can setup our react app to consume the prisma GraphQL endpoint. This is where our logic for the CRUD operations is based, the file is quite big, I&apos;ve omitted the irrelavant parts to make space for the crucial bits, you can view the rest of the code here. We also require the withApollo enhancer which provides direct access to your ApolloClient instance, This will be useful since we need to carry out one-off queries for fetching data for a recipe. As for the delete functionality, we will be doing a soft-delete on the deleted recipe which means we will be basically be changing the published attribute to false since when fetching the articles we filter to make sure we only get published articles. You can access the code here and you can also try out the demo app here. Prisma is a very highly reliable service that makes life easier for you as a developer, you get to focus on implementing you business logic and let prisma do the heavy lifting for your GraphQL server. I'm tech enthusiast, loves working on new ideas, I always appreciate a cup of coffee plus I enjoy watching and playing soccer when I'm not on my keyboard. 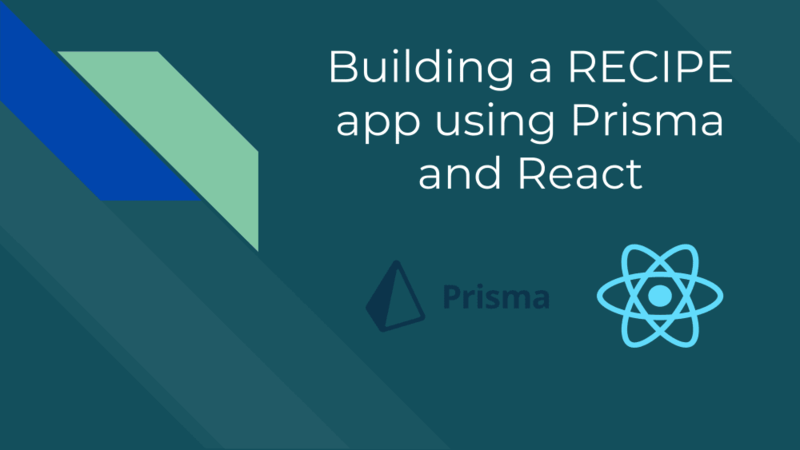 Learn the basics of prisma by building an interactive recipe app using prisma and react.